Coming off about a dramatic win as is possible, the Mets turned to Gabriel Ynoa in the second of their four-game set with the Phillies. Of course, no Met game would be complete without pregame news of a pitcher missing a start, and last night was no different as the Mets announced that Noah Syndergaard was suffering from strep throat. With Syndergaard scratched and Ynoa stepping in for the scratched Matz, that meant the Mets would start Seth Lugo, Ynoa, Sean Gilmartin and Robert Gsellman in four consecutive games in the middle of a hotly contested wild card race. What a world. Ynoa held the Phils scoreless in the first, but the second inning did not go as well. Freddy Galvis singled on a soft line drive with one out, and Cody Asche followed with a single of his own. Cesar Hernandez and Roman Quinn drove both of them in with two out RBI singles to give the Phillies a 2-0 lead. This would also end Ynoa’s start, as he exited after only two innings pitched, walking and striking out one. The Mets answered right back against Phillie starter Jeremy Hellickson, as Michael Conforto doubled with one out. 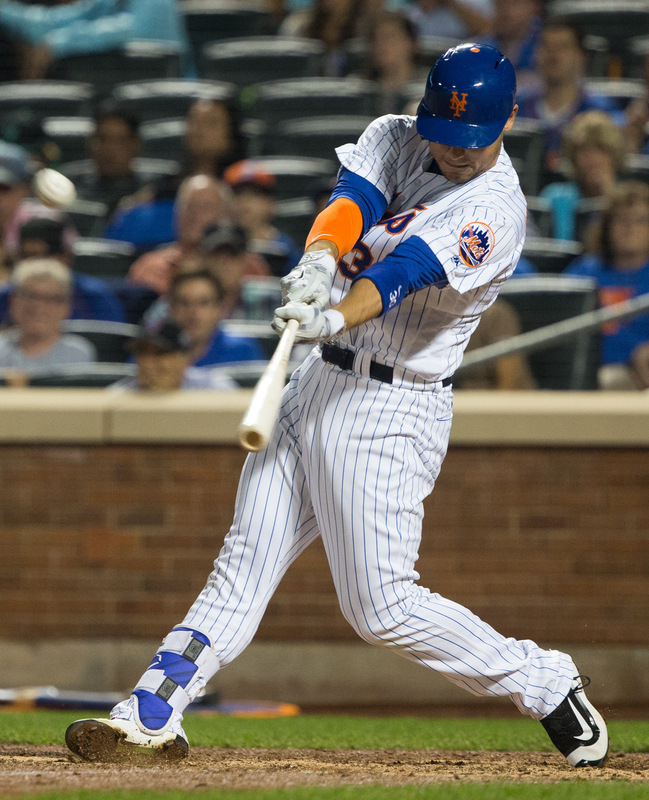 After Lucas Duda drilled a line drive out (some rotten luck, but already a big improvement over James Loney), Travis d’Arnaud drove in Conforto with a double of his own to cut the deficit to one. Unfortunately, the Phillies got the run right back, as Maikel Franco homered off Logan Verrett to start the third and put the Phillies up 3-1. The fourth inning was quiet as Verrett settled in and Hellickson held the Mets at bay, as was the top of the fifth where Josh Smoker tossed a perfect frame with a pair of strikeouts. The Met half of the inning was anything but. Rene Rivera lead off with a single, and walks to Asdrubal Cabrera and Yoenis Cespedes loaded the bases for Curtis Granderson. Granderson singled in Rivera, and Kelly Johnson followed with a two-run single of his own to put the Mets up 4-3. Discontent with a one run lead, the Mets managed to bring home three more on a three-run opposite field bomb from Conforto. Conforto’s double and homer gave him as many extra base hits as Jay Bruce has in the month of September combined. Don’t worry though, I’m sure Terry Collins will happily plug Jay Bruce back in the lineup with a trademarked “we’ve got to get him going” while Conforto is returned to rotting on the bench. Erik Goeddel relieved Smoker and got off to a rough start, walking Cody Asche and surrendering a two-run home run to Darin Ruf that cut the Met lead to 7-5. He retired the next three batters, but ran into more trouble in the seventh after Maikel Franco singled and Ryan Howard walked. Josh Edgin entered and gave up an infield single to Freddy Galvis that loaded the bases. Without Addison Reed and Jeurys Familia, Collins was forced to turn to Hansel Robles, who quickly induced a double play ground ball from Tommy Joseph to end the threat. Poor defense gifted the Mets some insurance runs in the bottom of the seventh. Cespedes led off with a double and Granderson walked. Collins then made the very bad decision of pinch hitting for Johnson against a lefty with Juan Lagares, who was presumably sent to the plate to bunt (almost always a bad move). Lagares got the bunt down though, and the Phillies threw the ball away, allowing Cespedes to score and putting runners on second and third with none out. Conforto was due up next, but as he’s entirely incapable of ever seeing a lefty pitcher ever, Eric Campbell was sent in to pinch hit. At least I presume that was the dialogue in Terry’s head. The move worked however, as Campbell drove in another run with a single. T.J. Rivera then pinch hit for Duda (a fine move, because Duda has a long history of ineptitude against lefties and just came off the DL) and drove in the third run of the inning with a sacrifice fly. The remaining two innings were quiet, mostly thanks to the superb pitching of Robles, who recorded the last eight outs of the game, allowing only one Philly to reach base on an error. He recorded three strikeouts over his 2.2 frames as the Mets nailed down their second consecutive victory, topping the Phils by a final score of 10-5. With the Cubs demolishing the Cardinals and the Padres topping the Giants, the Mets are now alone in the first Wild Card spot, one game ahead of San Francisco and a game and a half ahead of St. Louis. The remaining schedule is extraordinarily soft, with five games against the Phillies and three against the Marlins (who have been a pain for the Mets in the past, but are not a good baseball team). As it stands, the Mets control their own playoff destiny despite devastating injuries all over the team. Even if this season ends in disappointment, their resiliency is impressive.